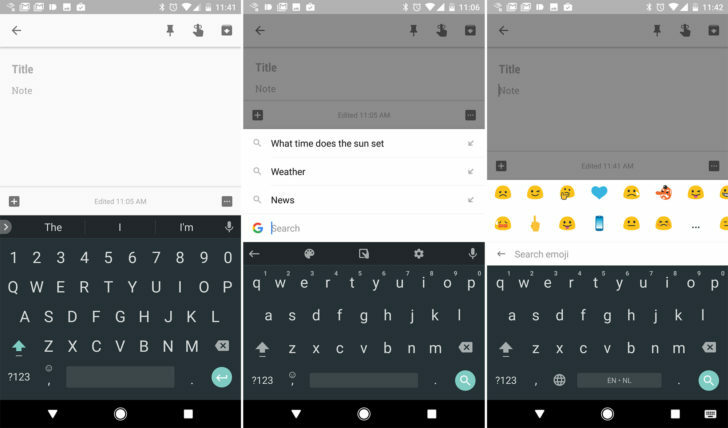 Google Gboard which was earlier released for iOS devices, is now available for Android as the v6.0 update to the current Google Keyboard. One of the highlights of the Gboard is the integrated Google search option within the keyboard. Other important features include a search shortcut, multi language support and a dedicated number row just like a computer key board. Let us now take a look at the important points regarding this update. The most interesting feature of Gboard is the integrated Google search button. G button can be enabled or disabled from the settings. Once you press the G button, you will be able to type in the Google search directly. The result of the search will replace the letter keys. This feature will be very useful for quick search while doing some other things. There is a dedicated number row, so you will not have to switch keyboard while typing. Like G button this is also optional. It can be switched on or off from the settings. Multi language support through which you can type up to 3 languages without changing the keyboard. This feature will be very useful for bilingual users. In addition to the multi language support, it also provides proper suggestions for these languages. Gesture typing helps in typing a word by sliding your finger from letter to letter. There is a rearranged emoji panel with group selection at the bottom. Instead of scrolling down for the correct emoji, you can type in the search box to find them directly. Emoji also have a bright halo effect around them. There’s a GIF button through which you can directly add an animated image into the chat. The Gboard 6.0 update is available via Play Store. If you don’t see the update just yet, you can also download it from Apkmirror right away.